MANILA, Philippines - The National Police Commission (NAPOLCOM) on Wednesday named the top 20 placers for April 26, 2015 PNP entrance and promotional examinations for Police Officer, Senior Police Officer, Police Inspector and Superintendent. May Ann Bandera Borlongan obtained the highest place for PNP Entrance exam, 87.83%. Elmond Ordoñez Monteron topped the Police Officer exam with 91.80% average grade. Meanwhile, Mustajar Jimlano Aradami got the top spot for Senior Police Officer promotional examinations. 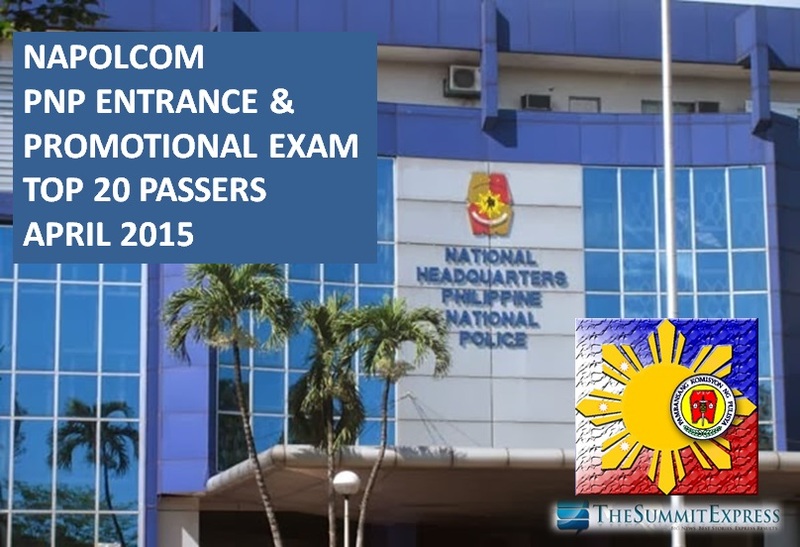 NAPOLCOM is yet to announce Top 20 examinees for the Police Inspector and Superintendent exams. On Tuesday, NAPOLCOM named a total of 2,110 out of 13,334 (15.82%) passers for PNP Entrance exam, 6,271 for Police Officer and 4,253 passers for Senior Police Officer promotional examinations. NAPOLCOM Vice-Chairman and Executive Officer Eduardo U. Escueta said that 13,334 took the PNP entrance examination while 22,340 are distributed to the various promotional test categories. Like Us on Facebook or Follow Us on Twitter for more updates on NAPOLCOM exam.